Background: Thiazole derivates as well as chalcones, are very important scaffold for medicinal chemistry. Literature survey revealed that they possess wide spectrum of biological activities among which are anti-inflammatory and antimicrobial. Objectives: The current studies describe the synthesis and evaluation of antimicrobial activity of twenty eight novel thiazole-based chalcones. Methods: The designed compounds were synthesized using classical methods of organic synthesis. The in vivo evaluation of antimicrobial activity was performed by microdilution method. Results: All compounds have shown antibacterial properties better than that of ampicillin and in many cases better than streptomycin. As far as the antifungal activity is concerned, all compounds possess much higher activity than reference drugs bifonazole and ketoconazole. The most sensitive bacterial species was B. cereus (MIC 6.5-28.4 µmol × 10-2/mL and MBC 14.2-105.0 µmol × 10-2/mL) while the most resistant ones were L. monocytogenes (MIC 21.4-113.6 µmol × 10-2/mL) and E. coli (MIC 10.7- 113.6 µmol × 10-2/mL) and MBC at 42.7-358.6 µmol × 10-2/mL and 21.4-247.2 µmol × 10-2/mL, respectively. All the compounds exhibited antibacterial activity against the three resistant strains, MRSA, P. aeruginosa and E.coli. with MIC and MBC in the range of 0.65-11.00 µmol/mL × 10-2 and 1.30-16.50 µmol/mL × 10-2. Docking studies were performed. 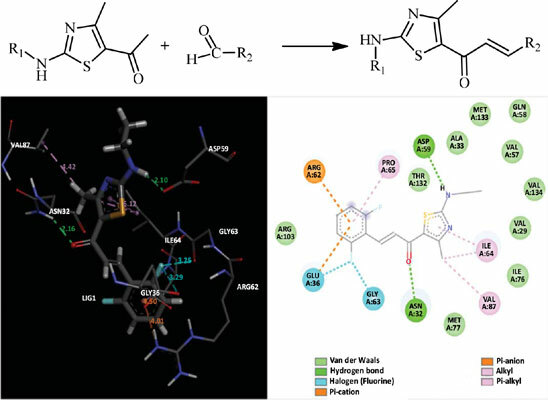 Conclusion: Twenty-eight novel thiazole-based chalcones were designed, synthesized and evaluated for antimicrobial activity. The results showed that these derivatives could be lead compounds in search of new potent antimicrobial agents. Docking studies indicated that DNA gyrase, GyrB and MurA inhibition may explain the antibacterial activity. Keywords: Thiazole, Chalcone, Antimicrobial, Antifungal, Microdilution, Docking, GyrB(1KZN), MurA, CYP51, Dihydrofolate reductase. Keywords:Thiazole, Chalcone, Antimicrobial, Antifungal, Microdilution, Docking, GyrB(1KZN), MurA, CYP51, Dihydrofolate reductase.